Every product in the world has a quality leader, and just maybe Lian Li fills that bill in the world of computer cases. This PC-61 model proves once again that attention to detail is key. With an aluminum construction – one with rolled and/or covered interior edges, polished surfaces and neatly turned thumbscrews, the PC-61 USB Cabinet is an attractive and sturdy case designed for ample storage capacity and quiet computing. This black case is ATX form compatible with a maximum size up to 12" x 9.6". Effective cooling is provided to the case by four 80mm fans, in addition any you might add for the processor and power supply. The speed of the two front intake fans can be adjusted manually for further internal temperature control. The chassis has a removable motherboard tray that makes it easy for installing or changing cards and components. Despite being just about 8" wide, 17.7" high, and 19" deep, this ATX mid tower has ample room for storage and system upgrades. With four external 5.25" drive bays, three external 3.5" bays, five internal 3.5" bays, and seven expansion slots, the case is ready to hold everything you’ve got. Enhanced connectivity is achieved by means of the two USB 2.0 ports at the front. Premium Aluminum Case The PC-61 aluminum case is an amazing mix of aesthetics and utility with Lian Li -ensured premium build quality and design. Excellent Expandability with 12 Drive Bays The PC-61 boasts four external 5.25" drive bays, three external and five internal 3.5" drive bays for superior expandability. Excellent Airflow and Cooling The PC-61 features four 80mm fans (2 in the front, 1 at the rear and 1 on the top) and optimum internal airflow for superior cooling performance. Convenient Front I/O Panel The PC-61's front I/O panel enables remarkably convenient access to two USB 2.0 ports. Pros: I really miss affordable cases that are not only aluminum but have sliding mobo trays. Why are these things so hard to come by these days? Lian Li used to be my favorite case manufacturer by far. Every case that housed my main PC for almost a decade was a Lian Li. They made competition very very fierce in this market. As a system builder in those days I believe I had 4 or 5 of the PC-61 black, and 8 of the silver variants. I believe all of them are still in use, well the ones who are owned by people I built them for. Cons: After fiddling with them with upgrades, system replacements, etc, I noticed with many Lian Li cases that their (then) trademark thumbscrews would be the first things to start stripping, a phenomenon I can't explain. I probably have and use a good thousand of those screws because Lian Li was always very generous with them. One case my friend still uses had immediate problems with stripped expansion slot holes. His stuff is held in today using standard ATX screws. No biggie. Other Thoughts: A few PC-61/60s came with fun little screwdrivers too. I have a lot of them, red/black with black magnetized tip. Not exactly the greatest things ever but at the time it was like finding a real toy in your cereal box instead of a coupon for Hamburger Helper or something. Pros: The Lian Li is the Volvo of computer cases. It's sleek, elegant, light, and includes intuitive tool-free snap mobo mounts and a couple of other bonuses that make PC building easier. For anyone that is looking for a modern/mature look in a computer case, always go with Lian-Li. I bought this case in 2005, and it's managed to stay alive in online stores, in my room and in our hearts. Thanks Lian Li for superior design engineering. Cons: My girlfriend hates it and I have no idea why. My computer runs perfectly from within this case. I have never had a heat related issue or anything like that. It's dead silent.. and she is still mad? Be warned, having this baby in your room is going to tick off some girlfriends. Pros: Solid case with LOTS of space, nice aluminum anodized finish, airflow is great and the fans are not too noisy. Cons: The sliding door does not fit as well as I would like and there is some rattling. I've resorted to applying some black duct tape at the seam to minimize this. Other Thoughts: This was my first computer build from scratch, and having this case it couldn't have been any easier, just plan your components carefully. Yes the hard drive cage can interfere with longer cards, just be careful with what you plan to put in it. 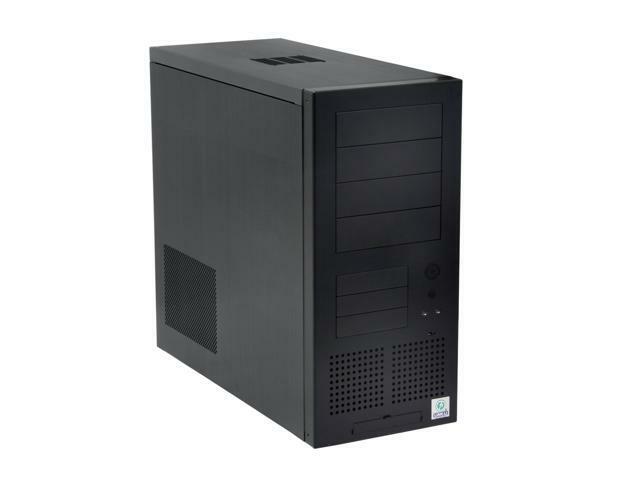 Other Thoughts: I just completed my first build using this case and it was a breeze. Cable management was easy. The removable motherboard tray makes it all too easy. Larger fans would be nice but the 80mm's keep it plenty cool. USB ports are located at very bottom of case. It's a minor inconvenience really though considering how much i like everything else about this case. Pros: Very solid case, very nice. lots of drive bays both internal and external. I'd love to add something else to the case but all the connections on the mobo are used up!!! No sharp edges anywhere, well thought out. The case is quiet, solid and well fitted together. Really like the air filter in the front of the case. Cons: Only two USB ports on front, no other ports. Could be added in one of the expansion bays though. Other Thoughts: I had never built my own computer before and spent a lot of time reading reviews before I bought the parts. Would definitely use Lian Li again. I love Neweg's web site. They make it very easy to find what I need! Cons: Seriously, who's buying this type of case these days: 80 mm fans all around!! Other Thoughts: Early 1990's design. Other Thoughts: I don't know why but the front 2 usb ports, when connected to my GIGABYTE GA-EG45M-UD2H LGA 775 Intel G45 HDMI Micro ATX Intel Motherboard - Retail, prevent the board from booting up; I need to not connect them for the board to work. Pros: This is an excellent case - *very* spacious inside for a mid-tower. Almost everything is removable - I was able to fit a EVGA 275 (beefy! graphics card) with no problem. Lots of fans. And the best part - all metal - absolutely no flimsy plastic in this case. Frankly you cannot go wrong with this purchase. Cons: Would love if there was a fan on the side panel - but if this is something you want - Lian LI sells other side panel option you could swap in for about $10. Other Thoughts: I consider myself a pretty middle-of-the-road builder - I use high end components, but nothing crazy (no water cooling, etc.) and for my type of builds this is perfect.